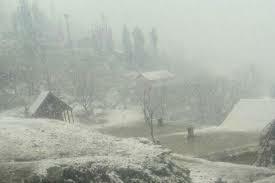 Srinagar, Apr 16 : The upper reaches received fresh snowfall on Monday while rain lashed Srinagar and other plains in Kashmir valley, resulting in dip in the day temperature. However, the temperature during the night improved and settled above normal due to overcast conditions across Kashmir valley, where wet weather is predicted for the next four days. A Met department spokesperson told TNN that light rain and thundershowers would occur at many places during the next 48 hours under the influence of a fresh Western Disturbance (WD), which hit the region on Sunday night. “The wet weather will continue till April 20,” he said, adding the weather will improve from April 21 onwards. Heavy rain lashed world famous ski resort of Gulmarg, about 55 km from here in north Kashmir, since early Monday morning, resulting in dip in the day temperature. “Apharwat, the highest point of the cable car project in Gulmarg, received fresh light snowfall while main Gulmarg received rain since early Monday morning,'' a hotelier told UNI over the phone. The night temperature in Gulmarg improved about 2 degree from Sunday and settled at 5 degree, which is over 3 degree above normal. World famous health resort of Pahalgam, about 100 from here in south Kashmir, also received rain since this morning, resulting in dip in the maximum temperature. However, the night temperature improved about 3 degree from Sunday due to overcast conditions and settled at 6.3 degree, which is 3 degree above normal in Pahalgam. Meanwhile, the upper reaches in Pahalgam, including Chandanwari, the last motorable halting station for Amarnath cave shrine on traditional yatra route, received fresh light snowfall. Amarnath cave shine and its periphery besides Sheshnag, Mahagung, Pisso top and Panjterni also received fresh snowfall. After witnessing pleasant weather from the last couple of days, weather again turned chilly in the summer capital Srinagar, due to fresh rain in the morning. However, as the day progressed sun played hide and seek though weather remained chilly due to ice cold winds. The night temperature in Srinagar improved about 4 degree since Sunday and settled at 11.9 degree, which is 4 degree above normal. On Sunday, the day temperature recorded in the summer capital was about 5 degree above normal. He said rain and thundershowers would occur during the next 24 hours in Srinagar, where maximum and minimum temperatures will be around 20 degree and 7 degree, respectively. Rain also lashed Qazigund, gateway to the valley, Kupwara in north Kashmir and tourist resort of Kukernag, resulting in dip in the maximum temperature. But, the mercury during the night at these places improved and settled at 8.8 degree, 7 degree and 9.6 degree, respectively. Fresh snowfall was also witnessed at Peer Ki Gali and some other places on Mughal road, which was closed due to slippery road conditions.